Smoking continues to be a leading cause of chronic disease and premature death in NSW. A hospital stay or interaction with a health service is a prime opportunity to help someone quit smoking. This Framework outlines how NSW local health districts (LHDs) can support health professionals to integrate quit support into routine care. Providing brief intervention for smoking cessation and the management of nicotine dependence is the responsibility of all NSW health professionals. 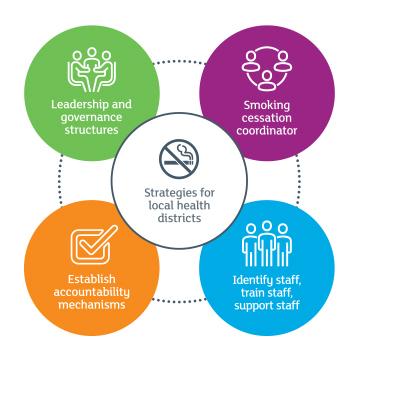 The Framework sets out four implementation strategies, including suggested actions and success factors, to provide practical guidance on how to develop and implement smoking cessation interventions within local health services. These strategies can be adapted to meet specific or local needs; in particular, to ensure appropriate community engagement for patients and clients from vulnerable and priority population groups. Supporting LHDs to manage nicotine dependence among patients and to implement smoking cessations interventions. What is a ‘brief intervention for smoking cessation’? It is important for LHDs to make smoking cessation intervention part of treatment and care for all smokers. This PDF document is a printable version of the NSW Smoking Cessation Framework. This PDF document is a printable version of the Framework on a page. Evidence shows that endorsement, sponsorship and support from executives at district and hospital levels is key to the successful implementation of smoking cessation interventions in health services. Read how establishing appropriate governance structures is also crucial to affecting practice change. Learn how smoking cessation coordinators can play a crucial role in the implementation and upkeep of smoking cessation systems of care across a range of clinical environments. Understand why clarifying roles and responsibilities in smoking cessation is an important step in clinical environments where staff have competing demands and multiple pressures. Find out how the use of data collection tools and feedback processes can increase the frequency and impact of smoking cessation interventions in hospitals and health services. The NSW Smoking Cessation Collaboration will directly contribute to implementing the delivery of routine brief interventions in smoking cessation through leadership and coordinated action.